Well, another Saturday, as it was dry hubby and me decided to go for a brisk walk around the boot sale, it was freezing first thing! Winter is definitely setting in, I think!! 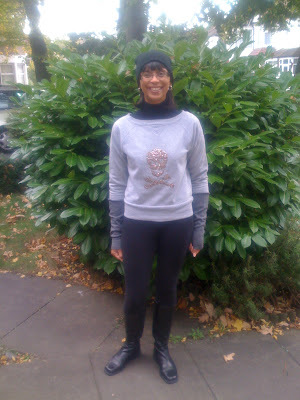 Here I'm wearing one of the grey tops I got last week, which was only 50p. I love the little gold and diamante studs which make up the skull and crossbone. I'm also wearing some diy grey wool armwarmers. These came about from a dress a couple of years ago that got shrunk in the wash, so I kept the sleeves as warmers to layer up an outfit!! 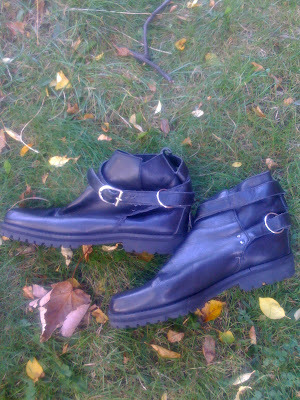 These are the biker ankle boots from last week too, which were £1. They are soo comfy, I'm yet to wear them though. Todays bargains were few and far between, it is definitely the end of boot sale season, I reckon. 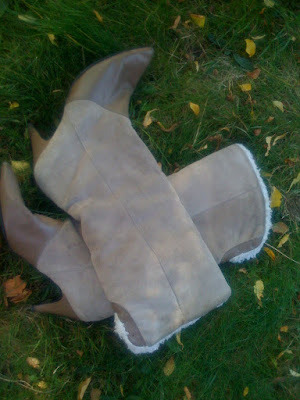 Still, I picked up these gorgeous leather and suede sheepskin lined boots for £1-I think they're from the 80s. They are a little too small on the right boot, hopefully my big foot will stretch it out!! 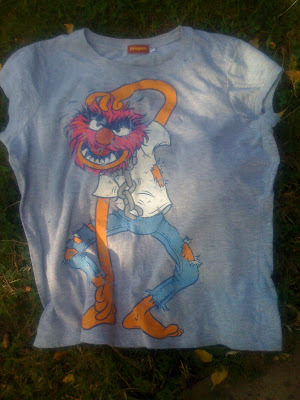 I also got this Muppets Animal top for 50p. I'm loving grey tops at the moment, I think because its such a neutral colour and goes with anything!! I can see this with a studded belt and jeans or leggings and my black leather jacket!! If you've been shopping this weekend, hope you picked up some great bargains!! You're going to need some skull and crossbone jewelry to go with that top! Hi wendy-why did I know you were going to say that, LOL!! Your muppet shirt makes me smile. Hi jess-Haha, thats why I got it too!! Hi ladies who lunch-haha, a blast from the past, I remember watching them as a kid!! Wow, great loot! I especially like the Muppet shirt. :) I had a good thrifting weekend too, there must be something in the air. Oh dear, sorry if this comment appears twice, blogger ate it the first time! Hi Sharon! I love the boots you found and what a great idea for the arm warmers. I like the first top. i have a skull print jacket too! Amazing as usual!! Loving the grey boots! Very pretty and soo you. Hi a cat of impossible colour-thanks for stopping by with both comments-haha! !Pleased you had a successful thrifting trip too! Hi deb-thanks a lot-they are really cosy!! Hi eleh-yup, I'm really pleased with them, thanks!! Hi savvy-yes, I'm so into the skull and crossbone on clothing!! Hi Silje-thanks so much my dear, hope you're having a good weekend! You are the boot sale queen! Love the Animal T.
Hi miss thrifty-thanks for your lovely comment!!! Love the muppets T - brill!! Hi Kate-LOL, too cute to leave behind! I really love the grey boots. What a fab find. Hi lenya-thanks a lot my dear!! Yet more great finds! Especially love the Animal tee - as a lifelong Muppet fan. Jealous of the muppet t! and those leather and suede boots. Hi fashion herald-thanks so much!haha, he is cute.it made me smile, i couldn't leave him for 50p!! As always, I'm jealous of your finds! Hi anny-thanks so much for your lovely comment my dear! !